I so enjoyed these five books of hope. Each of these five novellas centers around hope. I read these at a good time because I wasn’t feeling well myself. These center around a bronze bottle that a monk flings into the ocean in the year 834 AD. It begins in Ireland, then goes to Scotland, then New York, then Georgia and finally gets to California. In each novella the characters are well developed and I love each story. This book was very hard to put down. Each author wrote beautiful stories of hope. I received a copy of this book from the authors for a fair and honest opinion that I gave of my own free will. I give this five stars. This is such a fun ride. Madeline is a fun character. She is young and not sure what she should be doing in her life. She loves intrigue and is very observant of some things. Not so observant of men who have romantic ideas about her. This is 1901 and women still cannot do many things men can do but Madeline tries to get away with what she can. I like this in her. There is a bit of intrigue but this is more of a fun book. I received an ebook copy of this book from Celebratelit for a fair and honest opinion that I gave of my own free will. I think that this was one of my favorite books in this series. I love Sarah and Jonah. They battle through many troubles before the end of this book. They learn many lessons. I did not want to put this book down. I read this when I wasn’t feeling great and this still kept my interest. As always Amy Lillard did not disappoint me. I received a copy of this book from the author for a fair and honest opinion that I gave of my own free will. I am really enjoying this series with Bel. This is the second book in the series and both have been very fun. There is always a dead body at the manor but it is never in a gory way. I also like the underlying mystery that is included. I received this book from St. Martins’s Press for a fair and honest opinion that I gave of my own free will. Bel McGrath loves her work as a wedding chef. But with her latest event set to take place at Shamrock Manor, she just can’t seem to catch a break. The Casey wedding has left her with ten thousand greenbacks in the hole, a missing staff member, and a dead groom. Now, in between Guinness beers and pub brawls, Bel must find a way to crack the case–even though what she should be cracking are eggs into the batter of the wedding cake. A good Irish girl’s work is never done. . . What begins as local town fodder for an episode of “Wedding Gone Wild” is turning into “Gangsters with Guns.” With the Casey family spiraling out of control, and billable McGrath hours being lost by the minute, Bel is definitely in too deep. With all these shenanigans, she barely has time to obsess over her new boyfriend and her own unsolved mystery from years ago! Time is running out on getting the next couple down the aisle before the so-called luck of the Irish takes a deadly turn… Bel of the Brawl will keep Maggie McConnon’s fans, new and old, guessing. This is a fantastic romance. Amy is a rich girl whose father gets testy one day and throws her out of the house believing she will go to her supposed fiancé or her aunt. She fools her father and gets a job at minimum wage. I love how she learns to stand on her own two feet. I also love how Dusty learns to become a better man also. This is two people learning to be better people. Received this from Grand Central Publishing for a fair and honest review that I gave of my own free will. Amy Lyndon is tired of being the Poor Little Rich Girl of Shenandoah Falls. In her prominent family, she’s the ordinary one—no Ivy League education and no powerful career. But when her father tries to marry her off, she knows it’s finally time to stand up for herself, despite the consequences. Now that she’s cut off from the family fortune, her first challenge is to fight her attraction to her handsome new boss. When Amy shows up looking for work with his landscaping crew, Dusty McNeil thinks there’s no way such a pampered princess will ever get her hands dirty. But as Amy proves him wrong and gets down to the nitty gritty, Dusty’s admiration turns to like, then lust—and then love. But can a high-society woman like Amy ever fall for a man like him? I really enjoyed this book in the series. This has been one of my favorites. I loved al, the characters. Maisie and all of England have to realize that they are going to war again. They must all learn what their parts will be this time. I loved how this all came together. I received an ebook copy from edelweiss for a fair and honest opinion that I gave of my own free will. Sunday September 3rd 1939. 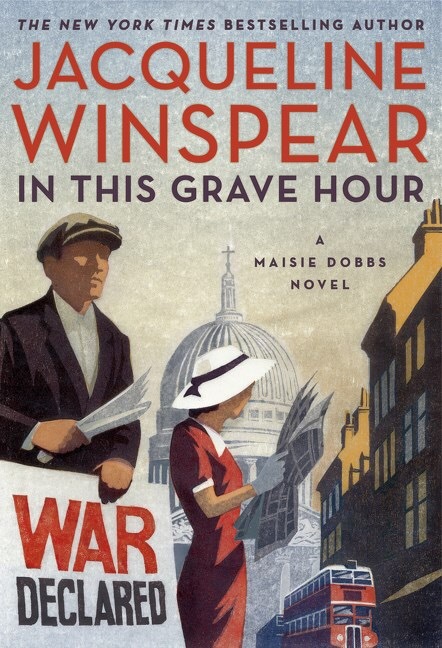 At the moment Prime Minister Neville Chamberlain broadcasts to the nation Britain’s declaration of war with Germany, a senior Secret Service agent breaks into Maisie Dobbs’ flat to await her return. Dr. Francesca Thomas has an urgent assignment for Maisie: to find the killer of a man who escaped occupied Belgium as a boy, some twenty-three years earlier during the Great War. In a London shadowed by barrage balloons, bomb shelters and the threat of invasion, within days another former Belgian refugee is found murdered. And as Maisie delves deeper into the killings of the dispossessed from the “last war,” a new kind of refugee — an evacuee from London — appears in Maisie’s life. The little girl billeted at Maisie’s home in Kent does not, or cannot, speak, and the authorities do not know who the child belongs to or who might have put her on the “Operation Pied Piper” evacuee train. They know only that her name is Anna. This is a wonderful western historical romance. I fell in love with Lydia, Travis and Aunt Bertha. I loved how Lydia decides to open the candy shop. All of that just sounded so delicious. I did not want to put this book down. I loved the romance and the slight tinge of suspense. I am so looking forward to the second book in the series. I received a copy of this book from Revell reads for a fair and honest opinion that I gave of my own free will.